One of the most important products, which is an integral part of many ladies makeup products is the eyeliner. 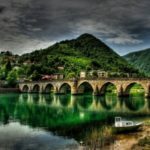 It helps you to emphasize your eyes and highlight your view. So far, I’ve always used liquid liners, but for a long time I’ve had the desire to try a pencil-shaped eyeliner. Guided by the positive impressions I have about Catrice products and the recommendations I have read, I have decided to try the Catrice Glam & Doll Super Black liner waterproof. What do I say about this product? Already at the very beginning of the blog I have to say that this is one of the few Catrice products that disappointed me. 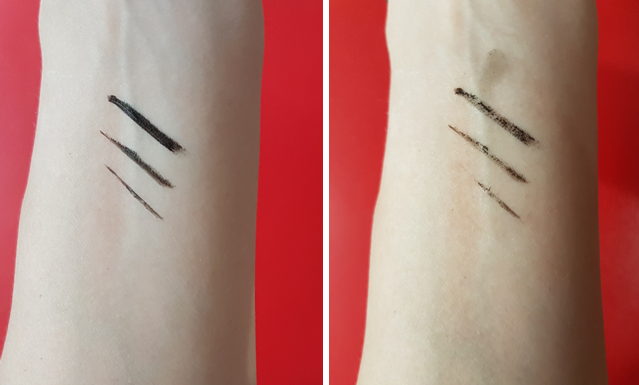 The manufacturer promised an intense black color and precision when applying, however the Catrice Glam & Doll super black liner did not fulfill either. The color is not intense and hardly stays on the eyelid. When I tried it on my hand, it acted promising, it seemed to me that it was nicely pigmented. However, it acted quite differently on the eyelid. I had to apply it several times to achieve an intense black color. In addition, the slightly pale line that remains after the first application is smeared and removed after you repeat the procedure. What I also did not like was that the Catrice Glam & Doll super black tool did not meet the water resistance requirement. It removed easier than products that did not carry the „waterproof“ tag. In the left picture, you can see how this toolkit looks on my hand, and in the right hand I blew myself up with water and gently flick through the lines. As you can see it is easily removed and smear. I gave him a few more chances and it was the same every time. I tried to find an excuse for this product, and the only thing that comes to my mind is that someone may open it before me and dry it a little. I do not find another justification. As for this product, it definitely goes to the black list and I would not recommend it. 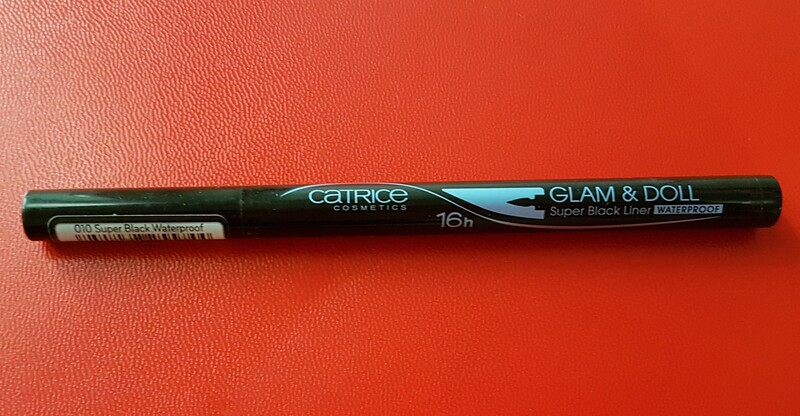 The only positive thing about the Catrice Glam & Doll Super Black liner I like is a beautifully designed application that is flexible and slim at the very top, which should increase precision and make it easier to apply the product. 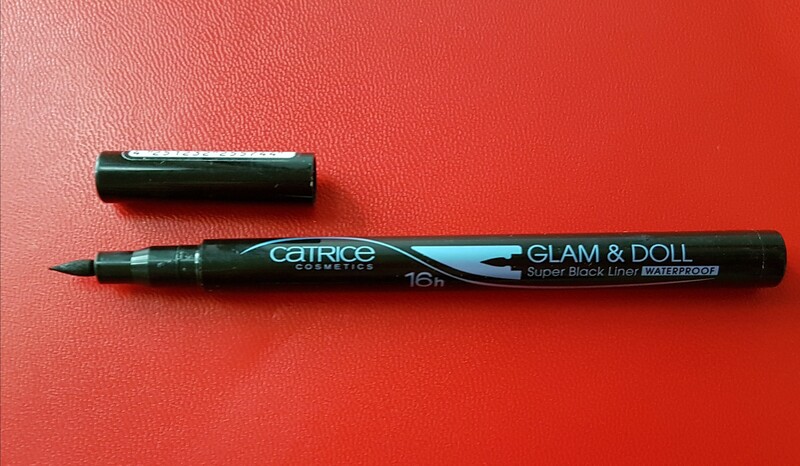 What does Catrice say about the Catrice glam & doll super black liner? Expressive line. With its innovative and flexible top in the form of tulips, the eye shower creates a waterproof, long-lasting and black eyeliner style. Thanks to the flexibility of the top, the shower is suitable for drawing thin and wide lines. Highly pigmented texture provides strong coverage with only one line. You can find more about Catrice products here.